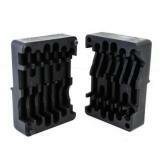 Our AR-15 upper receiver Vise Blocks fit both carry handles & flattop receivers. It locks into the table/workbench vise and lets you tightly clamp the receiver, holding the rifle firmly and securely without scratching or damaging the finish. Constructed of lightweight, heavy-duty glass-filled polymer this vise block is essential for some AR-15 assembly and repair.